For fans of retro games, the Classic Gaming Expo holds a certain allure. 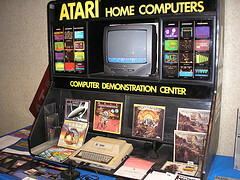 Ever since its founding in 1997 as the World of Atari expo, CGE has attracted guests from varying eras of the video game industry, including Steve Wozniak, Al Alcorn, Ralph Baer, and Rob Fulop. Collectors, exhibitors (who have ranged from Konami to Retro Zone), and video game enthusiasts the world over annually congregate for the event. Unfortunately, the 2008 show was canceled due to the inability of its organizers—Joe Santulli, Sean Kelly, and John Hardie—to find a venue, and it looks as if the 2009 show, too, has been canceled for as-yet-undisclosed reasons. Therefore anyone curious about the expo might also be interested in the CGE 2007 DVD box set, which is finally available for preorder after spending roughly a year in editing. As someone who was there in 2007 (and in 2004), I can honestly say it was one of the most entertaining conventions I’ve ever been to. Standing around chatting with Keith Robinson from Intellivision about a Burgertime movie a few of my friends made, to playing actual Pong and Computer Space arcade machines, to visiting the museum: it was just an excellent time. This DVD box set may well be the closest anyone gets to recreating that feeling, at least for a while! Kevin is a freelance journalist based out of Michigan, originally from Metro Detroit. He's also a lifelong video gamer and has been fascinated with the history of the medium since he was a small child. Psst... This site supports gravatars and OpenIDs. You may also format your comment using Textile markup, if you'd like. Comments may not immediately appear.